Turner Field is the site of the matchup between the Seattle Mariners and the Atlanta Braves on Monday, August 21, 2017. The probable starting pitchers are Andrew Albers for the Mariners and Mike Foltynewicz for the Braves. Seattle opens at -138 while Atlanta opens at +128. The Mariners have a 60-59-5 over/under record and a 57-67-0 run line mark. The Braves are 63-58-0 against the run line and have a 63-54-4 over/under record. The Mariners have a 63-61 overall record this season. Starting pitcher Andrew Albers has a 1-0 record with an earned run average of 1.80 and a WHIP of 1.40. He has 4 strikeouts over his 5 innings pitched and he's given up 6 hits. He allows 10.8 hits per 9 innings and he has a FIP of 4.74. The bullpen has an earned run average of 3.96 and they have given up 388 base hits on the year. Teams are hitting .234 against the bullpen and they've struck out 415 hitters and walked 161 batters. As a team, Seattle allows 8.7 hits per nine innings while striking out 7.7 batters per nine innings. They are 16th in the league in team earned run average at 4.48. The Mariners pitchers collectively have given up 1,068 base hits and 553 earned runs. They have allowed 190 home runs this season, ranking them 2nd in the league. Seattle as a pitching staff has walked 378 batters and struck out 945. They have walked 3.1 men per 9 innings while striking out 7.7 per 9. They have a team WHIP of 1.30 and their FIP as a unit is 4.80. As a team Seattle is hitting .261, good for 7th in the league. The Mariners hold a .421 team slugging percentage and an on-base percentage of .328, which is good for 13th in baseball. They rank 9th in MLB with 9.0 hits per game. Robinson Cano is hitting .275 with an on-base percentage of .335. He has 124 hits this season in 451 at bats with 77 runs batted in. He has a slugging percentage of .457 and an OPS+ of 112. Nelson Cruz is hitting .295 this year and he has an on-base percentage of .377. He has totaled 125 hits and he has driven in 100 men in 424 at bats. His OPS+ is 152 while his slugging percentage is at .571. The Mariners have 1,111 hits, including 220 doubles and 144 home runs. Seattle has walked 376 times so far this season and they have struck out 966 times as a unit. They have left 832 men on base and have a team OPS of .749. They score 4.73 runs per contest and have scored a total of 586 runs this year. Atlanta has a 54-67 overall mark this year. With an earned run average of 4.75, Mike Foltynewicz has a 10-8 record and a 1.50 WHIP. He has 121 strikeouts over the 127 innings he's pitched. He's also given up 141 hits. He allows 10 hits per nine innings and his FIP stands at 4.52. The bullpen has an earned run average of 4.64 and they have given up 373 base hits on the year. Teams are hitting .245 against the Braves bullpen. Their relievers have struck out 366 batters and walked 165 opposing hitters. As a team, Atlanta allows 9.1 hits per nine innings while striking out 7.7 batters per nine innings. They are 25th in the league in team earned run average at 4.81. The Braves pitchers as a team have surrendered 1,098 base knocks and 578 earned runs this season. They have given up 160 home runs this year, which ranks 12th in Major League Baseball. Atlanta as a staff has walked 438 hitters and struck out 921 batters. They give up a walk 3.6 times per 9 innings while they strike out 7.7 per 9. Their team WHIP is 1.42 while their FIP as a staff is 4.72. As a team, they are batting .260, good for 11th in the league. The Braves hold a .413 team slugging percentage and an on-base percentage of .322, which is good for 18th in baseball. They rank 8th in MLB with 9.0 hits per contest. Ender Inciarte comes into this matchup batting .298 with an OBP of .343. He has 152 hits this year along with 43 RBI in 510 AB's. He maintains a slugging percentage of .404 with an OPS+ of 96. Nick Markakis is hitting .277 this season and he has an OBP of .358. He has collected 125 hits in 451 at bats while driving in 59 runs. He has an OPS+ of 98 and a slugging percentage of .392. The Braves as a unit have 1,088 base hits, including 221 doubles and 129 homers. Atlanta has walked 341 times this year and they have struck out on 896 occasions. They have had 815 men left on base and have an OPS of .735. They have scored 4.55 runs per game and totaled 551 runs this season. 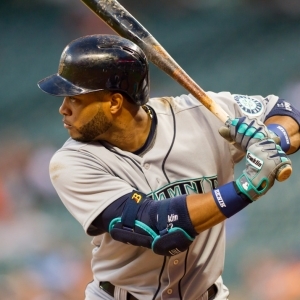 Who will win tonight's Mariners/Braves MLB game against the spread?